This section provides articles on a range of aspects of Bishopston's architecture and helps you to learn about good and bad architecture and design. 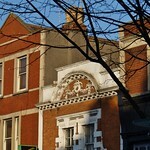 Ten Gloucester Road addresses have just been added to the council's list of 'Unlisted Buildings of Merit'. These are not protected in law, but this newly granted status will nevertheless be taken into account in any future planning applications that might affect them. 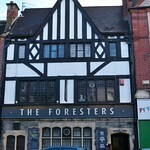 Developers have exploited a loophole in the Planning system and carried out a major act of vandalism to an historic site in central Bristol, destroying the Jacobean interior of a building in Small Street before its conversion to (yet more) student flats. In the photo album below we highlight some of the more interesting and unusual architectural styles, easily overlooked, that match the heterogeneity of the independent retail outlets and other buildings along this nationally praised shopping destination. This photo album below shows the exceptionally unusual and diverse architecture of the stretch between Zetland Road and Overton Road that has consequently been given the status of a Conservation Area by Bristol City Council. As our web site develops we intend to showcase online examples of good and bad architecture in our area, reflecting the display boards that local people may have seen at our events. Here are some initial examples to be going on with for now.